It’s taken Rob Innes and Dan Piazza 15 years to convince people their product is no joke. "There&apos;s a lot of gimmicky stuff out there, and the more gimmicky it looks the less people trust it," says Innes, co-founder and owner of Innespace Productions in Redding, Calif., which manufactures the Seabreacher — a 16-foot, mammal-shaped pod propelled by a personal watercraft 4-stroke engine and waterjet drive. "It&apos;s an adrenaline ride," says Innes, who founded the company with Piazza. They&apos;ve been working on this type of watercraft since the mid-1990s. "You can really throw them around. It&apos;s a high-performance submersible watercraft." Indeed, the Seabreacher — which is offered in the shape of a dolphin, shark or killer whale — can dive to a maximum of 5 feet. "Some have asked if it can be used as a military vehicle or a submarine," says Innes, 37, who previously worked for a New Zealand performance sailboat company. "It&apos;s a toy — a really fun toy, but a toy." As the name indicates, Seabreachers can jump out of the water like a dolphin or a killer whale. The watercraft can stay submerged for a maximum of 15-20 seconds because it uses an air-cooled, three-cylinder Rotax engine. But that 260-hp supercharged engine (closed cooling system) is a powerful one. Similar to an aircraft&apos;s three-axis control, the Seabreacher can pitch, roll and yaw. The sea-creature appendages on the craft perform important operational tasks, Innes says. The main dorsal fin is the snorkel (air source for the engine); the side wings serve as the ailerons and the rear fins are elevators. The Seabreacher can hit 40 mph on the surface and 20 mph under water. Innespace uses inflatable aircraft seals to make the cockpit and engine compartment watertight. Seabreachers are custom-built, and they’re hand-laid with fiberglass, core material and vinylester resin. The company uses enough foam flotation in the hull to make a Seabreacher unsinkable, Innes says. The standard two-seat Seabreacher (the J model) is $65,000; the X model (the high-performance, customized version) starts at $81,000. The company has sold 25 Seabreachers and has orders for another 22, Innes says. Another misconception people have is that the Seabreacher is "some sort of a sightseeing vehicle," Innes says. "It must travel at least 15 mph to dive, so [operating the watercraft is] really like a high-speed sport,” Innes says. Innes designs and manages the construction of the Seabreacher watercraft; Piazza takes care of the machinery, controls and engine. They started the company with a single-person unit with a 100-hp, 2-stroke engine, taking it to recreational product shows across the country for about 7 years. "We had a lot of demand for it, but we thought a two-seater would be more marketable," Innes says. "So we built the Seabreacher, a Coast-Guard approved production version of the dolphin. It&apos;s more practical, easier to operate and safer." Most customers can learn to operate the Seabreacher in a few hours. The company recommends at least four hours of training at its Redding facility. "Most owners come and stay in the area for several days for training," Innes says. 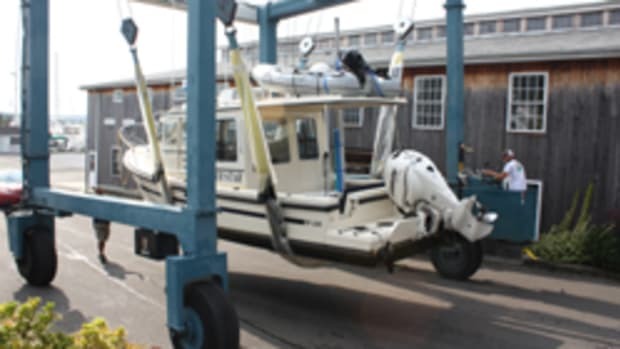 A support boat is recommended when a Seabreacher is used because curious boaters may get too close and become a collision threat. Visibility is limited in the Seabreacher, Innes says. Seabreachers can be designed for freshwater and saltwater use.